Louisiana Crawfish Man Etouffee Mix 2.5 oz. 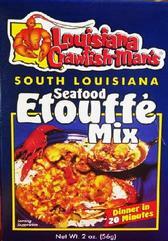 Home » Products » Cajun Dinner Mixes » Etoufee & Creole Sauce » Louisiana Crawfish Man Etouffee Mix 2.5 oz. Your favorite Louisiana Crawfish Man Etoufee Mix is back! Cooks in 20 minutes. Add your choice of vegetables, seafood, chicken, or even tuna to the mix. Serve over rice, noodles, baked potatoes, stuffed bread, or as a sauce over baked fish. Purchase in bulk to save!